In your gas tank gasoline turn bad quickly. 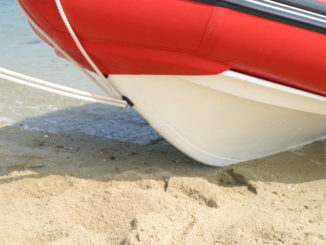 Indeed a few months are enough to decompose it and make your outboard engine inefficient and even cause serious problems getting your carburation system dirty. 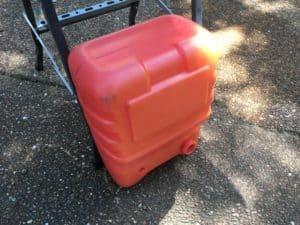 Here is the way to clean easily a portable gas tank. 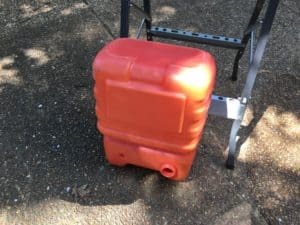 In general, never keep a portable gas tank with gasoline inside for a long time. 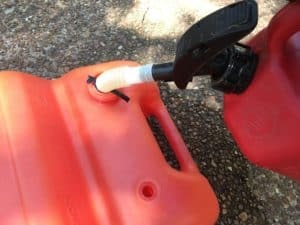 In season, it’s better to keep a gas tank totally full as air accelerates the gasoline decomposition. The more air you have, the faster the gasoline decomposes. 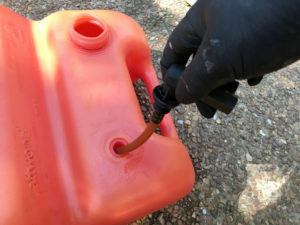 In the end of the season, empty the gas tank completely and, if necessary, rinse it well and let it dry. How to clean it ? Empty the gas tank completely. Do not hesitate to shake the gas tank to peel away potential sediments or dirt. If the gas tank is dirty, you can use a cleaner or a degreaser then shake strongly and empty again. 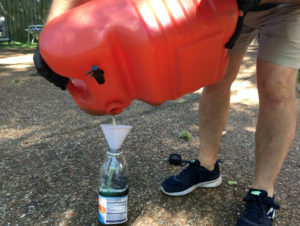 If the gas tank is really dirty, you can use different techniques. 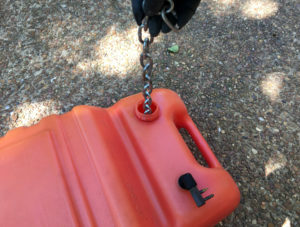 You can put a piece of metallic chain and a degreaser inside the tank and shake before emptying the tank. You can use a bended brush surrounded by a rag or a scratch sponge to clean the stubborn sections. Some people even use gravel or aquarium quartz. But careful not to leave something inside. Don’t use sand. Empty the gas tank completely and rinse it abundantly with water, several times if possible. Unscrew the aspiration system and clean carefully the inlet filter, ensuring that no impurities remain. 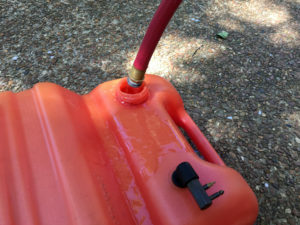 Leave open filling and aspiration openings and let dry completely the gas tank under the sun. There should not remain a single drop of water. To be sure there is no more water inside, make a final rinse with clean gasoline and empty again the gas tank, then let it dry out. 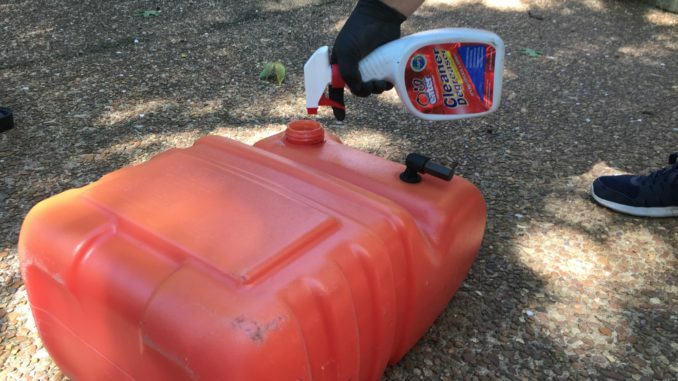 When the gas tank is completely dry, store it in a dry place at a constant temperature. Avoid areas subject to frost or large temperature changes which could cause condensation and mold. A basement, a garage adjacent to the house or a store room is perfect. 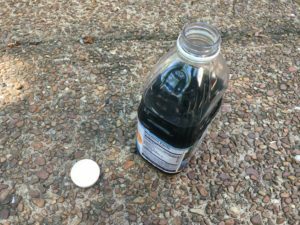 Do not dump the old gasoline in a corner of your land or do not use it for the BBQ. It’s a toxic pollution and it’s also toxic for plants and for you if you use for the BBQ. Go to the recycling center, it’s easy and respectful to nature. 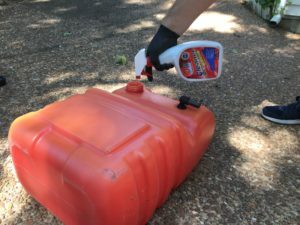 For gasoline used with a four stoke engine, without oil or additive, you can incorporate in small quantities into your car or your mower.